If you use it, we can probably make it. A Natural Bug Spray is easy to make with essential oils. After all, we already know that a lot of plants will repel insects. If you want a huge list on that, check out 20 Insect Repelling Plants. You can plant these plants around your yard to help keep the biting insects away, but what about when you’re not on your back porch? When at soccer fields, taking a hike, or doing garden work, it’s great to have a tick repelling natural bug spray that really works and is not toxic like commercial sprays. Have you ever been at an event or even out hiking when you find yourself inhaling a strong waft of poison from someone near you as they put cancerous chemicals all over them in an effort to avoid a bug bite? It is highly illogical to try and look after your health by rubbing poisons into your skin and inhaling poisons into your lungs. It is highly illogical to try and look after your health by rubbing poisons into your skin and inhaling poisons into your lungs. Obviously, it can be dangerous to get bitten by ticks and some people are extremely sensitive to bug bites. But there’s a natural solution. I have a great story and many who witnessed the workings of this bug spray recipe. First, we’ve used this recipe for years and found that it works wonderfully for mosquitoes and other bugs. But what about ticks? My daughter and her friend used this recipe while at camp. My daughter gave her self two spritzes from arms length. Her friend spritzed herself down and rubbed it in. She also used a spray of geranium essential oil. They proceeded to a camp fire gathering where a group of them sat on the edge of the clearing by the woods. I’m guessing they sat beside a recent hatching of ticks, because they looked down and had literally hundreds of tiny ticks all over the legs and crawling up their arms. Hundreds! The one in the center of the group who DID NOT HAVE EVEN ONE was my daughter’s friend. Amazing! The geranium addition is key! Geranium seems to have a great repelling effect on ticks. 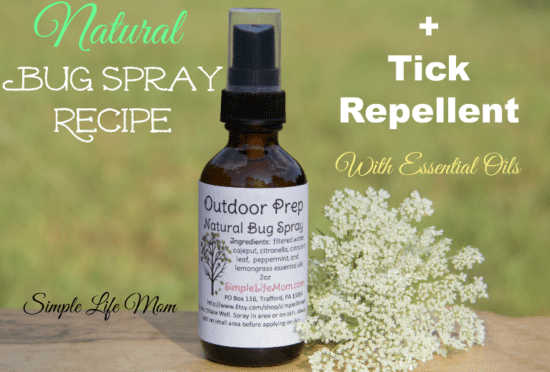 I’ve made an all around Natural Bug Spray recipe that doesn’t just keep mosquitoes away, but repels ticks as well. As my story indicates, you do need to use it liberally! My daughter gave herself a tiny spritz and was still covered (hers didn’t have geranium at the time either). This recipe does call for a number of essential oils. If you do not have these and do not wish to purchase all of them, you can get this bug spray in my shop. Combine all ingredients in a 2 ounce amber glass spray bottle and fill with filtered water. Spray liberally for ticks, less for mosquitoes and other biting bugs. Always patch test essential oil blends before general use! Essential oil safety is important. Click HERE for essential oil safety guidelines. 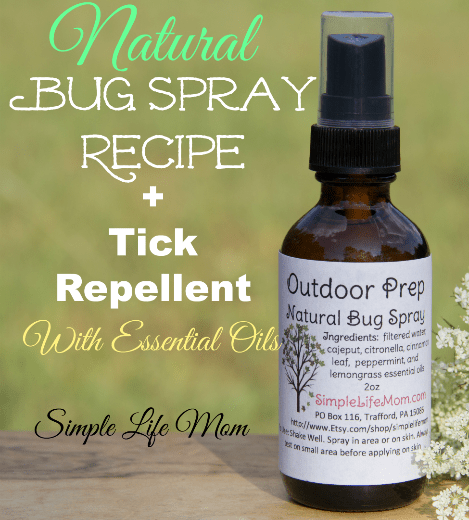 As I stated above, you can find this natural bug spray and tick repellent in my shop. Will this work on dogs? Yes, cats are very sensitive to essential oils and I never recommend using oils on them, but dogs can really benefit. Make sure to patch test on them just as you would a person, because each one can react differently. what is cajeput oil? I’ve never heard of it. Is there something I can use in it’s place? i already have the other oils in your recipe. I’m excited to try it. It’s another herb. You can leave it out if you don’t have it. It will still be effective. Is this ok to use on a one year old? Patch test first. It may be too strong and need to be diluted first. Shake well before use. Can I substitute spearmint for use on children ? Wow; the story about hundreds of ticks on the kids’ bodies is NUTS! My mom recently got diagnosed with Lyme Disease, so now I am extra cautious when outdoors. The geranium oil is one I haven’t seen used a lot, but I’m going to give it a try.